Doreen Green may have all the powers of a squirrel, but for her most recent challenge, she has to turn to a different skill set to save the day: her computer programming knowledge. 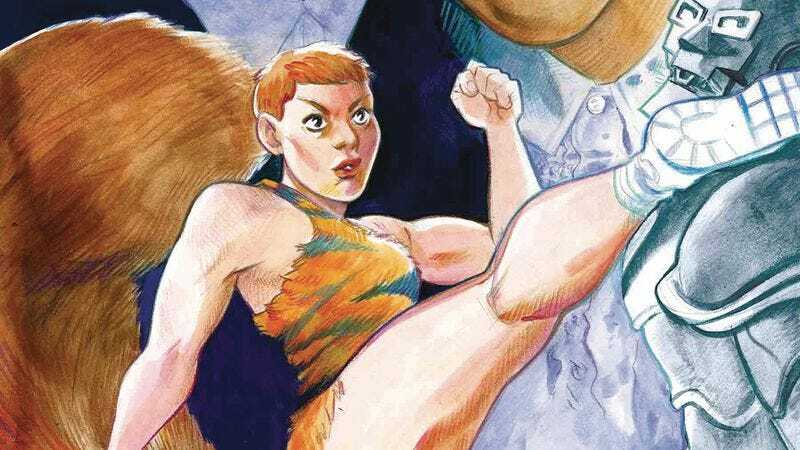 The latest The Unbeatable Squirrel Girl storyline has Doreen and her roommate Nancy getting far away from New York City (currently under siege by Hydra in Secret Empire) as they take a trip to the Savage Land, where they have been tasked with repairing the prehistoric environment’s alien technology with a group of other programmers. Squirrel Girl just won the Eisner Award for Best Teen Publication last month, and it’s very well-deserved given how consistently entertaining and enlightening this series has been for nearly three years. The fact that writer Ryan North, artist Erica Henderson, and colorist Rico Renzi have made this book last so long speaks to the strength of their work together, and they’ve developed an incredible rapport that makes each issue totally captivating. This exclusive preview of next week’s The Unbeatable Squirrel Girl #23 has Doreen and Nancy learning the stakes of their new mission, and the creative team finds ways to have a steady stream of humor even when all that’s happening is exposition and computer programming. Squirrel Girl always begins with laughs thanks to the Twitter-inspired recap page, and this month’s issue uses the recap to fill Doreen in on the Hydra-centric action happening around the world, which she is willfully ignoring because she’s not going to pass up an opportunity to save the dinosaurs. This creative team is not shying away from just how damn cool dinosaurs are, and the first issue of this arc spent a considerable number of pages showing off the majesty of these creatures. There’s sure to be more dinosaur action down the line, unless Doreen and the rest of the coders fail, but they don’t call her the Unbeatable Squirrel Girl for nothing.